Competitors see the callback list and scores, but have no idea why they did or didn’t make it. Wouldn’t it be nice to offer them some guaranteed, qualitative, constructive feedback to give them an idea of what’s holding them back? 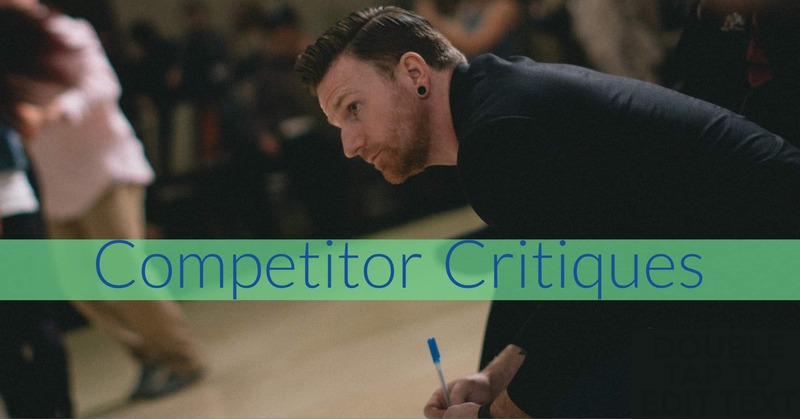 Competitor Critique service provided by a designated assessment-specialist judge. Not all judges are trained in movement analysis. They can provide their experienced opinion on the competitors, but they are less able to articulate exactly what they saw, or moreso, how to fix it, especially in the short timeframe required in judging prelims. As a veteran chief judge and master movement analyst, Myles and Tessa are exceptionally skilled at providing this analysis. Event announces the Competitor Critique service to the attendees in advance of the event. Competitor pre-register at the comp desk for a Competitor Critique, before contest registration closes. Target price: $20-30. Registration provides Myles/Tessa with the list of names to critique. Myles/Tessa is issued a clipboard with heat sheets along with the other judges, but is not scoring. Myles/Tessa assesses the dancers, recording notes. Myles/Tessa are paid for the critiques by the event at the end of the weekend. To request our signature Competitor Critique service as part of our event contract, please contact us directly. Swing Literacy Intensives are open to all, with no pre-requisites. Phoenix 4th of July, Phoenix, AZ, July 5-8, 2018.